Do you remember this little book from 1968 calling to you from an elementary school’s library shelves? I remember it clearly, but probably more for the cover (which has always appealed to me) than the content. It’s one of those children’s books which fall into the category I call Adults-Will-Appreciate-This-Book-More-Than-Children. And now the children at my elementary school won’t even know about it because it was pulled from the shelves several years ago. I suspect one of the main reasons is because it contains the word “witch”. In several places. Even though it’s not about making spells, it’s about making friends. Lonely Elizabeth walks to school alone, until one day she sees a shoe dangling from a much smaller foot in the tree above her. The girl owning the shoe, and the foot, is Jennifer, a self-proclaimed witch who befriends Elizabeth and initiates her as an apprentice witch. The story is utterly charming, filled with experiences of my own childhood: mothers leaving beauty parlors with piled up hairdos, shopping at the A & P, feeling lonely but not minding it too much because the popular girl is “two-faced and mean”. Who wouldn’t prefer being alone? Who wouldn’t rather befriend Jennifer and march around a magic chalk circle after spilling a drop of blood (each) and a drop of spit (each) to seal a promise? I certainly would like to be her friend for the sheer imagination she possesses, let alone indifference to popular opinion. Which has never been a friend of mine. I don't remember this book either, but it does sound especially enticing. I loved From the Mixed-Up Files of Mrs. Basil E. Frankweiler. 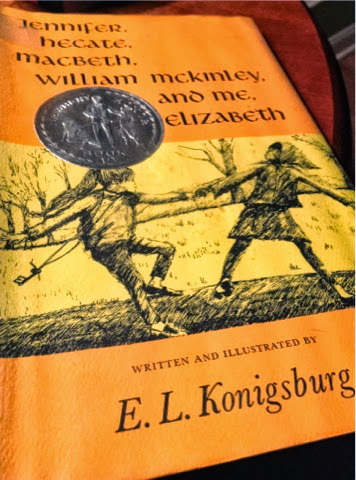 I don't recall reading this one, although the title is familiar, but I'm sad to hear that any Konigsburg has been pulled from the shelves because her books are wondrous. Mixed-Up Files is one of my childhood favorites. Not one I've heard of, guessing it's from your side of the water. I'd love to read this. I'll definitely look it up. I've never heard of this one until now, but it definitely sounds like a book I would love 🙂 I'm heading off to look it up now – thank you!! I loved Harriet The Spy! I've been wanting to read that to my class for quite some time. Perhaps this is the year…that, plus The Mixed Up Files. Love that we have these connections of children's books. Now I really want to reread From the Mixed-Up Files of Mrs. Basil E. Frnakweiler. Isn't that the one where the children are somehow stuck in a library in New York City? Wouldn't it be wonderful if all our beloved books were easily accessible to all of us? I don't think it did make it over the pond, as Parrish Lantern hasn't heard of it. It almost seems appropriate to write of this on the heels of Banned Book Week. No one would say this book is banned, officially, but our district has become very leery of anything that I took for granted as a child…witches included. Now I want to know what you and Stu read as children! I'm guessing some Enid Blyton? Good to hear from you, Mrs. B.! It's a very short read, I read it Friday night in one sitting, and I'm not a super fast reader. I just loved the story and the original perspectives presented. You cannot be embarrassed, Diane, after all the literature under your belt! I've never heard of this one but I must get to it — I adored The Mixed-Up Files of Mrs. Basil E. Frankweiler!! How can so many of us have missed this one?? Harriet the Spy is probably my favorite book from childhood… there was a time when I used to read it once a month! Whoa! I had no idea that From the Mixed-Up Files of Mrs. Basil E. Frankweiler was published in 1968! I thought it was fairly recent! wow. SO, I'm really out of the loop on this author. Hmmmm. Nope, never heard of this one. Haven't read anything by Konigsburg, although I think my daughter did. It's making me smile how many of us readers loved Harriet The Spy as a child. And here I thought I was alone! I should have known I was amongst friends. I'll check our children's department today. Love your new banner, by the way! No, a museum! Maybe the Met? I seem to remember that they sleep in a bed in one of the period rooms.. Okay, now I really have to look up this book! In a museum would be too cool…my class would love that. This looks delightful and one I somehow missed as a child.